There’s this great restaurant in Beirut called Em Sherif, owned by Mireille Hayek. 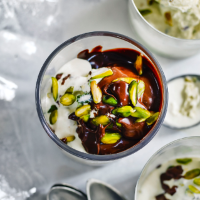 Her brilliant truffles and ice creams inspired these sundaes. 1. Start by making the sauce. Whisk the cream, milk, cocoa and honey together in a saucepan, then stir in the tahini and bring to the boil, whisking gently all the time. Simmer for a few minutes, then remove from the heat and stir in the chocolate and rosewater until smooth. If it’s too thick, thin with a little water to a pouring consistency; cool and chill. 2. Soak the pistachios in boiling water for about 3 minutes, then drain and peel off the skins to make the green colour stronger. (Skip this if you’re short of time.) Roughly chop and set aside. 3. Reheat the sauce until just warm and thin enough to pour luxuriously. Layer 2-3 scoops of gelato in glasses and finish each with the warm sauce and a scattering of pistachios.